Just give me a bronzed lid and loads of mascara and I’ll be happy, basically. I’ve got three options, to cover all bases. Starting with my oldest favourite is MAC Indianwood – it’s my favourite cream shadow, basically. I use it on an almost daily base, and find it the perfect base to use under any shadow. Technically not a liner, but I use it a lot smudged all round the eye and it has the staying power of a liner! In the morning when I’m in a rush, I find it such a quick and easy pick that manages to make eyes look like you’ve gone to more work than you really have. Also an excellent pick to go under any bronze shadows like Amber Lights or Woodwinked. If I’m looking for something where I want to smudge shadow under the eyes, I reach for the Charlotte Tilbury colour chameleon in Bronzed Garnet. It’s a gorgeous rusty red bronze that has a little bit of an Ashley Olsen vibe going for it… gorgeous, smudge-free formula. 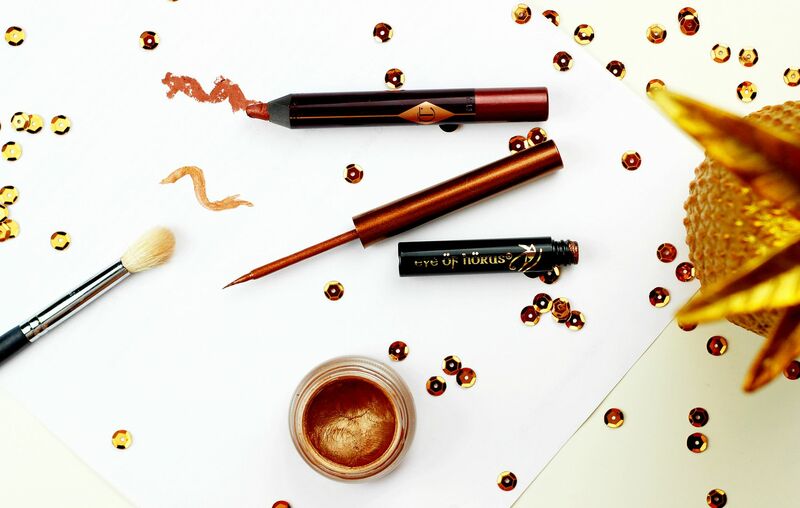 If I want a cat flick with a twist I reach for the Eye of Horus liquid metal liner in Imperial Bronze – I like this especially with a paler champagne shade all over the lid for some extra bronzed goodness. This is a must have for anyone with blue eyes! What’s your favourite colour shadow to wear?